Unilever Earth Month Contest - Win a Washer & Dryer Set! Home » Contests » Unilever Earth Month Contest – Win a Washer & Dryer Set! 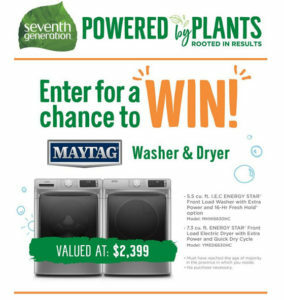 Enter for a chance to win a MAYTAG Washer & Dryer! one (1) Maytag® Front Load Electric Dryer with Extra Power and Quick Dry Cycle – 7.3 (Model: YMED6630HC) (ARV: $2,399.98). Shopper’s Voice – Win $1500 & Get Free Stuff!